It's an understandable reality that many of us want to enjoy a little slice of comfort and luxury when we travel, but there are certainly some hotels that deliver this better than others, and which exude effortless elegance and sophistication at every turn. The hotels explored here are globally renowned as being the most luxurious hotels in the world, and it is definitely worth treating yourself to a stay at one of them at least once. Surrounded by vivid wildlife, fragrant flowers, and ancient boulder formations believed to have special spiritual properties, there is simply no setting that is more peaceful than the grounds of the Boulders Resort & Spa in Arizona. A property that is owned and managed by the Hilton hotel group, this contemporary style desert hideaway is the perfect location for a spa retreat. The Boulders Resort & Spa is situated in the Sonoran desert, close to Scottsdale, Arizona. Enjoy pleasant settings and privacy in your private casitas or villas equipped with your own patios. Relish spa treatments in this stunning picturesque setting that has been associated with mindfulness and wellbeing for centuries. Take on the 24km Blackrock Mountain Trail located nearby the hotel property. The hotel chef, Brian Archibald won Food Network's "Beat Bobby Flay" competition in 2016. Boulders Resort is the only hotel in Scottsdale with rooms featuring wood-burning fireplace. Many of us dream of spending time at our very own private, uninhabited desert island. 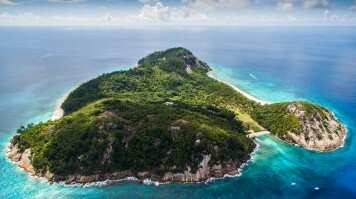 Though this is not exactly an attainable fantasy for many, a stay at the North Island resort in the Seychelles — undoubtedly one of the most beautiful hotels in the world, offers travelers a slice of that paradise. A visit here means access to soft white sandy beaches, translucent turquoise waters, and not a soul around to interrupt your vacation time. With only 11 villas on the island, you have a lot of space and privacy. The North Island resort prides itself on its privatised dining experience. Guests can enjoy bespoke dishes delivered directly to their villas. No demand is too great or too small. Evenings can be enjoyed unwinding over candlelit dinner at the piazza or watching the sunset and sipping a cocktail or two at the West Beach Bar. 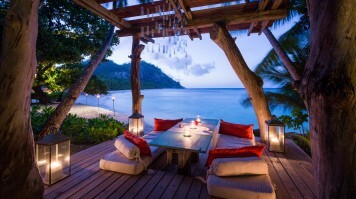 The North Island resort is renowned for being a celebrity honeymoon destination. Notable celebrities such as Brad Pitt and Jennifer Aniston, and Prince William and Princess Kate have all been here for their honeymoons. 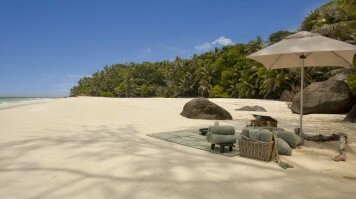 Honeymoon Beach, one of their private beaches can be booked for a day. 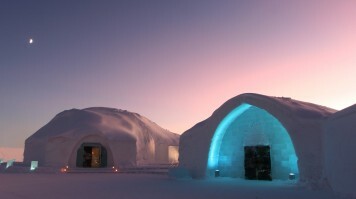 The Icehotel in Sweden is undoubtedly one of the most famous hotels in the world — owing largely to its unique proposition. 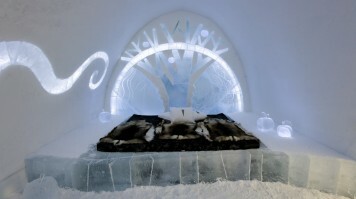 Situated in the quaint Swedish village of Jukkasjärvi, the hotel is constructed from ice and snow and offers a once-in-a-lifetime eskimo style experience. Partake in a number of unique and adventurous activities — from ice sculpting to river rafting along the Torne and fast-paced sled rides. Experience the ambience of sleeping in an igloo in the "cold" rooms or opt for "warm" rooms which are more standard style luxury hotel rooms with the usual amenities. Notice quirky ice sculptures and decorates created by respected artists from around the globe. Most of the Icehotel, except for the new Icehotel 365, melts away every year in April. But new ice rooms are reconstructed every winter in November by different artists and sculptors. At an average of -5 to 7 °C, the "cold" rooms in the Icehotel are pretty cold and require the use of thick thermal clothing and sleeping bags even inside. 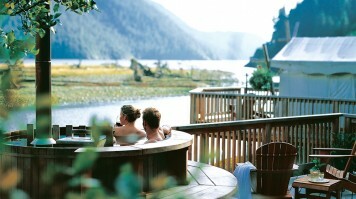 The Clayoquot Wilderness Resort is luxury but not as you know it. Rather than taking the form of your typical cookie cutter five-star hotel, the resort has a rugged, wild exterior that allows guests to be at one with nature. 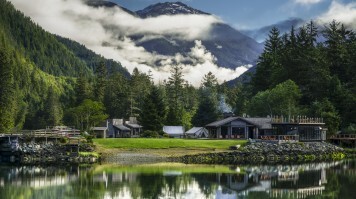 Located in the Clayoquot Sound Biosphere Reserve, the resort is the perfect spot for those who enjoy hiking, observing wildlife, or generally being at one with the great outdoors. 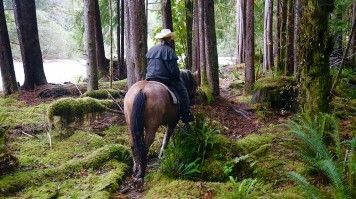 The scenery here easily makes Clayoquot one of the most beautiful hotels in the world. Take part in a plethora of outdoorsy activities, including horseback riding, helicopter adventures and fishing excursions. Indulge in hot stone massages, mindfulness and beauty treatments — all beneath the trees and nature of Clayoquot. Accommodation exists in the form of luxury tents featuring en-suite bathrooms, heated flooring and plush interior furnishings. Its remote location means that it is only accessible by a seaplane, boat or helicopter. The vegetables, meat and fish used in their dishes are grown and sourced locally so everything that winds up on your plate is incredibly fresh. 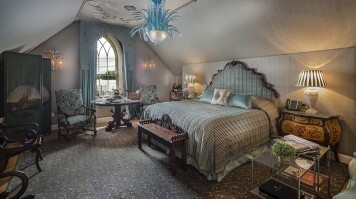 One of the most luxurious hotels in the world, a stay at Ireland's Ashford Castle is a stay fit for royalty. The castle, dating back to 1228 has passed hands through quite a few notable figures in European history and attempt to gain ownership of the castle was the reason behind many medieval battles. Today, it has been lovingly restored and renovated. From the elaborate chandeliers that hang from the various rooms and chambers, to the ornate furnishings, anyone staying here is sure to feel like a King or a Queen. 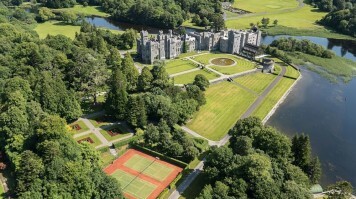 Set among a phenomenal 350 acres of woodlands, lakes and gardens, the castle offers guest a host of outdoor activities — from kayaking and fishing, to horse riding and falconry. 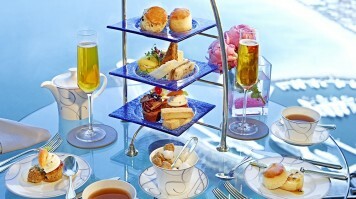 Enjoy traditional afternoon tea served in The Connaught Room with a selection of champagnes, teas, sandwiches and cakes. There are many dining options available for guests across numerous restaurants on the premises — from bistro style Irish dining in the dungeon, to multi-course fine dining at the George V Dining Room. All guests have access to the gym, which offers unparalleled views out over the Lough Corrib. The 1950s movie "The Quiet Man" starring John Wayne and Maureen O'Hara was shot on-site at the castle and in the neighbouring village of Cong. It is possible to take tours of the region to explore the notable settings from the movie. The present-day hotel is a result of a USD 75 million renovation that lasted 2 years. Designed as a desert oasis in the midst of the otherwise arid and unwelcoming rolling sand dunes, the Qasr Al Sarab Desert Resort is the ultimate in exotic getaways and its grandiose appearance and friendly, hospitable staff demonstrate the very best of Middle Eastern hospitality. 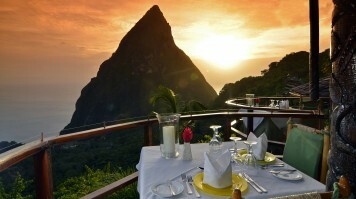 The resort is without hesitation one of the most luxurious hotels in the world. Its rooms create a magical atmosphere with private balconies and cabanas looking out over tranquil gardens and Arabian sand dunes for the perfect sunset setting. Live like a Bedouin Wanderer for a day and head out into the desert on a camel ride and a desert picnic or Bedouin camp organised by the resort. Get your heart racing and your blood pumping by engaging in a little dune boarding action, or zipping through the sand dunes in an off-road 4x4. 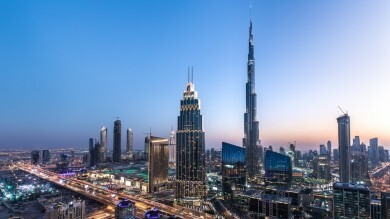 With tennis courts, a free form pool and a comprehensive fitness centre, guests can be sure to stay in shape during their stay in the Arab Emirates. The numerous restaurants at the resort enable guests to sample cuisines from all corners of the globe - from traditional Arabic food, to Mediterranean or American dishes. 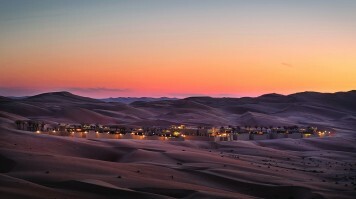 The Liwa desert where the hotel is situated is in fact the largest undisturbed stretch of sand in the world. With miles of sand dunes, a misty desert haze, and not another soul to be seen, it makes sense that this ethereal atmosphere was used as the setting of choice for many scenes in the Star Wars movie — The Force Awakens. There is a strict no-children policy for the private villas in their Royal Pavilion complex. The Philippines Nay Palad Hideaway is precisely as the name suggests — a tropical hideaway offering a desert island paradise and a barefoot travel experience. Located on the beaches of Siargao island, the unique landscape offers plenty of exploration that means that no two days at the Hideaway will be the same. 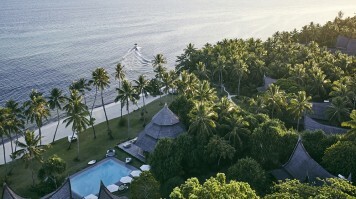 With mangrove forests, underground caves, isolated beaches and tropical rainforests, the luxury traveller has plenty to do to occupy their time between spa sessions and time spent unwinding by the sea shore. From stand-up paddle and surfing, to kayaking and water-skiing, the hotel can organise water sports activities and classes for guests. The resort offers island hopping tours that enable guests to explore the diverse culture of the Philippines. 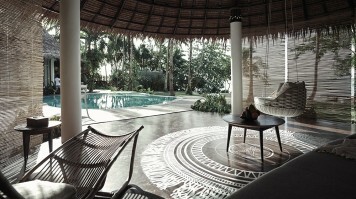 First class treatments are available at the spa, as are yoga and meditation classes. World class Chef Mark Silvestre mans the kitchen at the hideaway. This is great for your dining experience as it ensures that only the highest quality, most lovingly prepared dishes are consumed. Better still, aspiring chefs or foodies can enjoy cooking classes under his expert guidance. All nine villas in the resort are made from recycled wood. 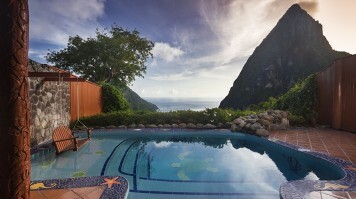 With the towering peaks of the Piton mountains, and the crystal-clear waters of the Caribbean Sea both encapsulating its premises, the Ladera resort in the West Indies is truly one of the most beautiful hotels in the world. 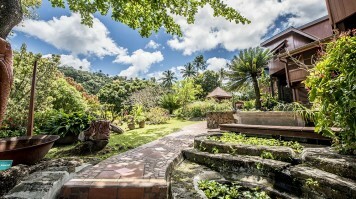 If you are looking for a unique setting that differs dramatically from your standard luxury hotel then you have found it here. The resort is placed on the edge of a 1000m volcanic ridge. From your private balcony, you have magnificent birds eye views of the region, and the perfect place for your Instagram shots as you sip your morning coffee. The hotel avails beach shuttle service to nearby Sugar beach which is situated smack in between the Pitons. An array of pampering treatments can be enjoyed at the Ladera resort spa. The hotel's wine cellar stocks over 2,000 bottles of wine. Guests can participate in exquisite tastings with expert sommeliers. The property within which the resort is located was once part of the Rabot estate — one of the region's oldest and most famous cocoa plantations. It is possible to participate in tours that enable you to sample the beans and the chocolatey delicacies that they create, in addition to uncovering the history of the Soufrière region. The resort is eco-friendly — the furnishings and wooden floorings are locally harvested and made on-site by local craftsmen. In the heart of the glistening Emirati city of Dubai, the Burj Al Arab is not only one of the most iconic pieces of architecture in the Middle East, it is one of the most iconic buildings in the world. Constructed in the shape of a sail, this is one of the most exclusive hotels in the world, and a stay here is something that will be remembered for a lifetime. 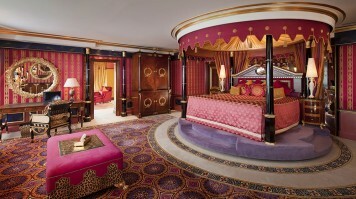 The Burj Al Arab is cited time and again as being number one of the most luxurious hotels in the world. 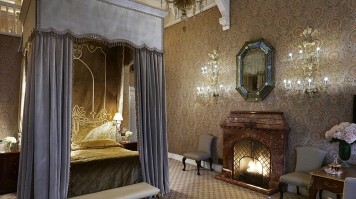 All guests receive a private, 24-hour butler. The hotel boasts five swimming pools and a private beach. Fabulous packages are on offer at the Talise spa. 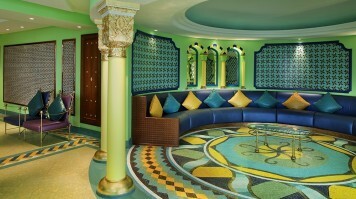 Parents can leave their kids in the care of the hotel's Sinbad kid's club. With nine on-site restaurants, guests are sure to find a meal that pleases their culinary palate. 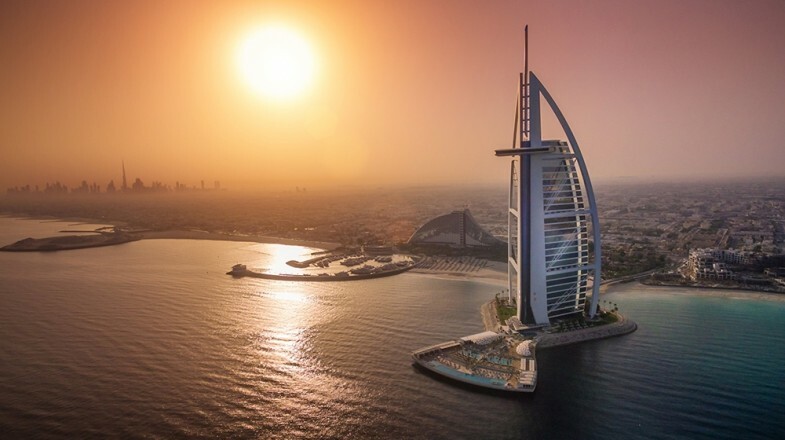 The Burj Al Arab is the world's only seven-star hotel, guaranteeing incredible levels of luxury at every turn, with guests having their every whim catered to by their private butlers and the accommodating hotel staff. 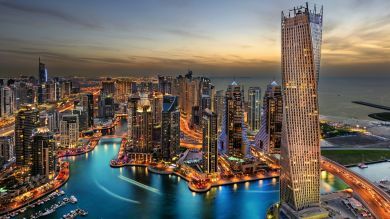 The hotel is situated upon one of Dubai's man-made islands. Around 1,790 sq. 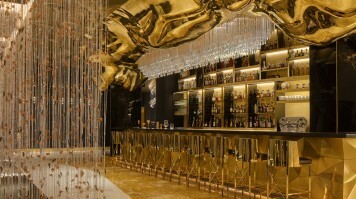 meters of 24-carat gold leaf was used to decorate the interiors of the hotel. A Masai Mara safari and the opportunity to get up close and personal with some of the most majestic creatures on earth is something that tops the bucket lists of all travelers venturing to Africa. 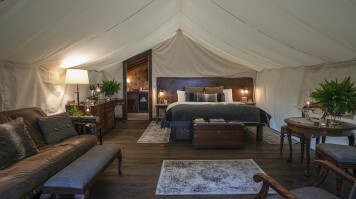 Situated on the confluence of the Sand and the Keekorok rivers, in a secluded and peaceful part of the renowned Masai Mara, Sala's Camp is one of the most beautiful accommodations in the world, placing guests out among the African plains, beneath the banyan trees, and offering incredible views over the Masai Mara and Serengeti. Head out on a early morning game drive to find the big five. Indulge in interesting experiences such as sundowners and volley ball in the section of river in front of camp where there are no hippos or crocodiles. Participate in the nightly sharing of stories around the campfire and feel like real life wilderness explorers. Sala's camp is the first place in the Mara to witness the wildebeest migration — meaning that there really is no better place to base yourself during your African adventure. The Camp closes in April and May, and then in November due to the rains. 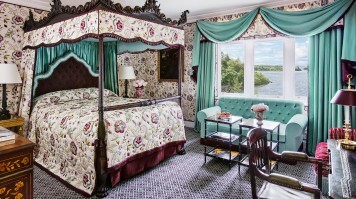 The most luxurious hotels in the world are varied and span all corners of the globe. Each one of the hotels featured possesses a distinctly unique personality. Whether you are an outdoorsy type, a culture vulture, or a traveler that likes to enjoy a slower pace when you travel, you will find a luxury hotel that caters to your desires. *Note: Prices are as of August 2018.